A slalom course is made up of numbered gates hanging from ropes stretched across the river. You have to paddle your kayak through the course from the start to the finish line. Your score for the run is the number of seconds for the run plus two penalty points for touching a gate and 50 penalty points for missing a gate. Each gate has a crossbar, a gate number and two striped poles. There are two types of gates, downstream and upstream. Downstream gates are marked with green striped poles and upstream gates use red striped poles. You must go through a gate in the correct direction. In addition to using the gate color as a guide you can look at the number panels hanging from the top of each gate's crossbar. You'll see a red slash through the gate number if you're going the wrong way. the gate the wrong way. 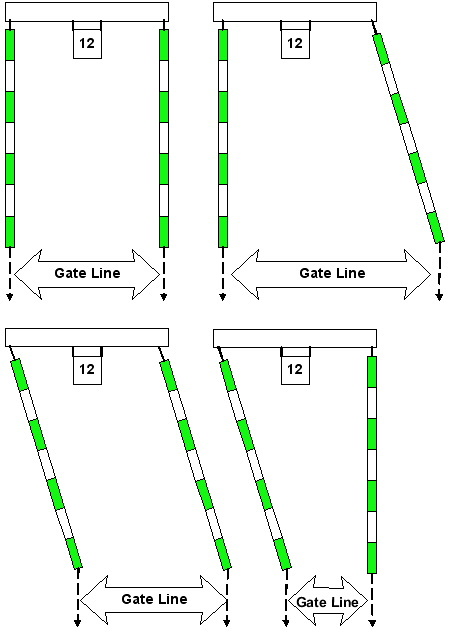 All gates must be negotiated in numerical order and in the correct direction as indicated by the gate color and number panel. green gates and upstream through the red gates. Your boat can be pointed in any direction while you're going through the gate. (downstream) so this is fine. The Gate Line is an imaginary line drawn between the tips of two poles at any instant, whether they are hanging straight down or they are moving due to wind or someone bumping into them. If the poles are moving the gate line can be wider, narrower or moving side-to-side. Negotiation of a gate begins when the boat, paddle or the paddler touch a pole of the gate or any part of the paddlers body (torso and head) crosses the gate line. You've correctly gone through a gate when at least your complete head (in C-2 the heads of both paddlers) and part of the boat have crossed the gate line at the same time, moving in the correct direction. You've completely negotiated a gate when you move completely through it in the correct direction and you start negotiation of the next gate or cross the finish line. If you've started going through a gate, but haven't yet completed negotiating it, that gate is still subject to penalties. Once you've complete a gate and start negotiating the next gate, the first gate is dead and you can hit it all you want and you won't be accessed any further penalties on that first gate. If you go through the gate correctly and move on to the next gate with neither the boat, paddle or paddler touching a pole you've cleanly negotiated the gate an no penalty seconds are added to your time. Water or wind moving the gate is not a penalty, but you still can't touch a gate even if it was moved by wind, water or another paddler. You can also pass part of your boat and body under a pole with no penalty as long as you don't touch the pole. If your boat, paddler or your body touches a pole it's a two second penalty. Touching the gate's crossbar or number panel is NOT a penalty. Penalties are not cumulative on a gate. Once you've touched a pole you can touch it all you want and you'll only penalized a single two second penalty for that gate. If you completely miss a gate or touch a gate, but don't complete negotiating it and then start negotiating a gate further down stream it's a 50 second penalty for each gate not completed. If you pass by a gate but haven't started negotiating a later gate you can paddle back up stream and give it another try. This takes time, but if you can do it in less than the 50 seconds you'd get penalized for missing the gate, you're still ahead. If you've missed a gate and been penalized 50 seconds you can then hit that gate with no further penalties. Pushing aside of a pole in an attempt to make it through a gate or lessen a penalty. This penalty is assessed only if the pushing materially affects the negotiation of the gate. 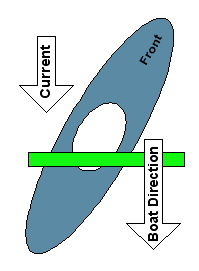 It is not judged an intentional push when the body and boat of the paddler was already in a position in which it would have negotiated the gate. Rolling while your body (in C2 either body or between the bodies) is within the gate. It's a roll if your entire torso (trunk of the body, not including arms and head) (in C-2 either competitor) is under the surface of the water. You go through the gate in the wrong direction. At no time while you're going through the gate can your head go through the gate line in the wrong direction. Once you've started going through the gate your head and body must clear the gate in the correct direction. If your head or body starts moving backwards through the gate it's a 50 second penalty. Repeated negotiations of a gate are not penalized provided renegotiations are in the correct direction and no poles are touched. In all doubtful or borderline cases, the competitor is given the benefit of the doubt and the lower penalty. In particular, if a Judge is in doubt as to whether movement of a pole was caused by contact or by a water splash, no penalty for a pole touch may be given. If you roll on the course other than while going through a gate there is no penalty. If you swim out of your boat you are disqualified for that run. You should get yourself safely off of the course as quickly as possible. All judging stations should have throw ropes and there are safety boaters at the finish line. If you hear repeated short whistle blasts, given by a Judge you must immediately pull off of the course and wait further instructions. Reasons for whistling a competitor over include another racer is overtaking you, something went wrong with timing your run, something is wrong with the course or there is a safety issue. If you are overtaken by another racer while on the course you may be whistled over. In any case you should let the boat that caught up with you have the right-of-way. You can start again when you can do so without interfering with the racer who just passed you. Unfortunately you can't get back any time you lose while pulling over. If there are unusual circumstances your may be granted a rerun. If you think you'll be slow on the course let the starter know so they will give some extra time before starting the boat after you. On rare occasion the overtaking boat may be whistled over and held, allowing the overtaken boat to continue. 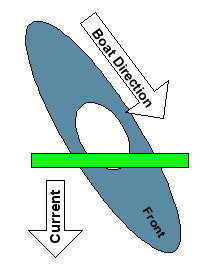 This could occur if the overtaken boat is running the course correctly, while the overtaking boat is doing so by running largely out of control and missing gates (the "Mad Bomber"). Any time lost goes against the boat whistled over, and there will normally be no rerun. If a competitor has been interfered with by another boat, he/she may be granted a rerun with the authority of the Chief Judge. To merit a rerun, interference must be substantial and unavoidable, presenting a material impediment to the course. 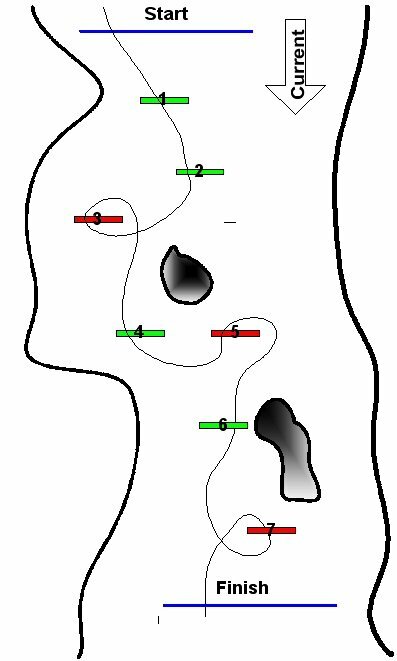 Contact usually, but not always, is interference. Lack of contact usually, but not always, is not interference. Intentional contact where it could have been avoided, or other unsportsmanlike conduct in attempting to create interference to obtain a rerun will not be tolerated and could result in disqualification. If a rerun is taken, the score for the original run is canceled and may not be considered for placement or listed in the results.